If you are looking for an absolutely amazing one-day ride that will astound you and leave you with a true appreciation and respect for the incredible bio-diversity and richness of culture that surrounds Quito, this tour is for you! The tour heads out of Quito and immediately into the lush, green Nono Biological Reserve, known as one of the world's most biodiverse forests. The unpaved route to Mindo is magical, with opportunities for swimming in waterfalls, birdwatching and picnics. Mindo offers many exciting and educational activities such as coffee, chocolate and butterfly tours and outdoor activities such as rafting and zip lines. The return to Quito is on an exciting paved road packed full of twisties as well stops to visit the Pululahua Crater and the Inti-ñan Museum, right on the Equator. The tour can be done in one day (starting at 10:00 am) or with an overnight (starting anytime 11:00 am - 1:00 pm). Visit a working coffee plantation and see how coffee is grown, harvested, dried, selected and roasted. The Route of the Hummingbird is one of the most beautiful unpaved roads that is lined by waterfalls and the Nono Cloudforest Reserve. The Pululahua Crater is a caldera formed from the collapsed volcano after it emptied its magma chamber during the eruptions dating back to 500 B.C. or 2500 years ago. This type of formation is typical of very strong eruptions that weaken the internal structure of a volcano. The caldera has three lava domes, Pondoña, El Chivo, and Pan de Azucar, which formed in the years following the eruption, and after the volcano collapsed. You will head out of Quito, rising in elevation as you climb the foothold of the Pichincha Volcano, getting absolutely spectacular views of the city below. Once over the pass, your surrondings will go from urban to country in an instant. You are now surrounded by green pastures and the sounds of the city are replaced with the sounds of rolling brooks and streams and chirping birds. You will descend into the smal village of Nono.- a quaint, friendly little place that feels a world away from Quito. There are a few good restaurants in the center of the small town. Once outside of Nono, you may want to stop for a swim in the beautiful Guagrapamba Waterfall. which is just along the route and can be reached after a short hike. Your ride will continue along these country roads with virtually no traffic bring you high into the elevations and bring you to the "Virgen de Camino Mirador" overlook. Stop here and get some great views of the valleys below. Then you will descend along a rolling river of cold, clear water and into the rainforests for a completely new biological habitat. You may catch a glimpse of some wild toucans or brightly colored frogs. You will pass by the world famous Tandayapa Bird Lodge. You can stop here for lunch in their restaurant or just sneak a peak at their amazing balcony and be surrounded by hundreds of hummingbirds in a show that will fascinate you. Back on the road, the aromas and sounds of the rainforest you will experience will be something that stay with you long after this ride is over. If you didn't get a bite to eat at the Tandayapa, you can also stop for lunch in the Bellavista Cloudforest Bird Lodge. They offer incredible over-the- canopy where you can get a great meal while watching hundreds of bird species. Then you will head from the cloudforests into the warm microclimate of the town of Mindo. This funky, eclectic town offers great restaurants, bars and activities such as zip wire canopy tours and innertube rides down white water river. Once in Mindo, you will head to the El Quetzal for a tour that will educate and entertain you. You can taste some freshly roasted local Ecuadorian coffee, some of the best in Ecuador. You will learn about organic cocoa farming and processing. You will learn how cacao is turned into chocolate from the moment it is picked from the tree to the completed chocolate bars. The Chocolate tour starts every day at 4 PM and there is a charge for your tickets which are not included with the Ecuador Freedom Chocolate & Cloudforest tour. If you want to learn more about coffee growing, harvesting, processing, roasting and proper preparation of coffee you can visit the Mindo Coffee Tour. Also the Butterfly Garden is an amazing place with hundreds of butterflies in various stages of life from. You'll see jewel-like chrysali, caterpillars and beautiful colorful butterflies. After visiting the sites in Mindo, you will headback onto the asphalt road, passing through the cloudforest town of Nanegalito. Continue on this road and you can stop to see the huge Volcanic crater, the Pululahua Volcanic Crater. On the way back into Quito, be sure to stop at the Museo Intinan to learn about the astronomical observatories established at the Equator by ancient indigenous cultures. You can also perform some fun and interesting experiments to show you the strange gravitational effects that can only be observed on the Equatorial line. Then, head back into Quito - and you will have finished the tour. We hope you will share your photos and experiences with your friends! 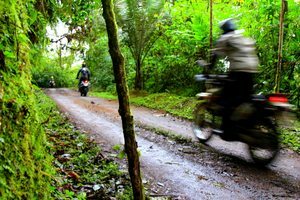 The tour can be done in one round-trip if you pick up and return the bike around 10:00 am or if you want to stay overnight in Mindo (see the extension below for an exclusive hotel offer) then it is best to pick up the bike around 1:00 - 2:00 pm. This trip has an activity rating of 3/5. The offroad section requires a rider who is comfortable riding on unpaved surfaces and with sections of mud and in rain which is possible in the cloudforest. The unpaved sections are slightly challenging and are reserved for experienced riders. The tour may be done as a 100% paved route if requested. The itinerary suits a wide range of interests and abilities, with options for light and moderate activities . Weather and temperature ranges in Quito are generally the same year round. You can expect the chance of passing showers but rarely a full day of rain. Chances for a full day of rain are more likely in April and early May. On this tour, temperatures will be between 60 and 80 degrees fahrenheit (4-27 celsius). The cold temperatures are experienced at the high elevation point (refer to the elevation profiles on this page).